You may not realize it, but by letting your child carry a heavy backpack everyday, you are subjecting him to a serious health danger. 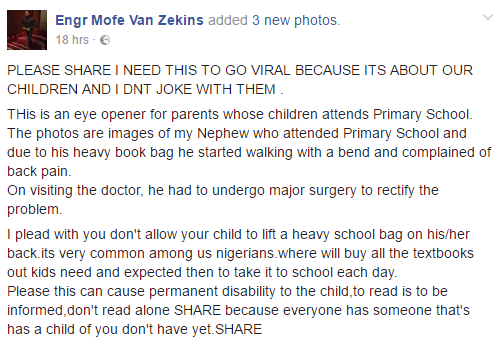 Studies show that the cause for majority of kids who develop irreversible back deformities can be traced back to the weight of their school bags. According to medical experts, a child may suffer from permanent back damage is he is carrying more than 15 percent of his body weight on his shoulders. Childhood is a crucial period for bone growth because a child’s skeletal is still growing; making him also susceptible to bone deformities if left neglected. Unfortunately, most kids nowadays carry overloaded backpack which are heavier than what they can actually manage. 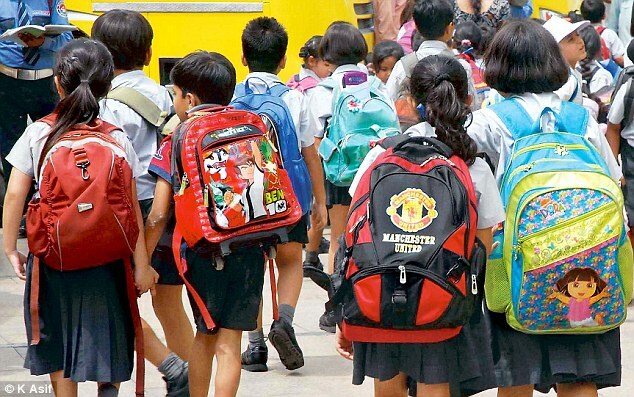 This is because most school nowadays don’t have adequate space for lockers, forcing children to carry everything with them that’s why it is not surprising that the number of schoolchildren who experience back problems are increasing. Take this case for example. Recently, a distraught netizen turned to social media to raise awareness against other people who are letting their kids carry heavy backpacks to school everyday. Facebook user Zahir Ali posted graphic images of his nephew who suffered an irreversible spine condition for regularly carrying an overloaded bag. This is an eye opener for parents whose children attends primary school. The photos are images of my nephew who attended primary school and due to his heavy book bag he started walking with a bend and complained of back pain. On visiting the doctor, he had to undergo major surgery to rectify the problem. 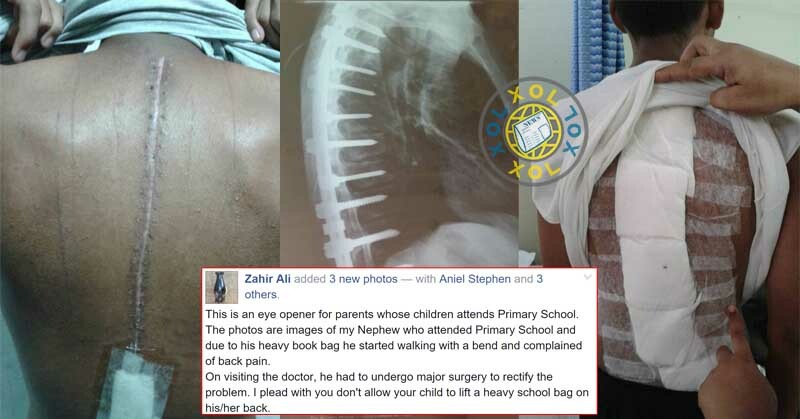 I plead with you don’t allow your child to lift a heavy school bag on his/her back. What’s worse than a simple back pain is a permanent spine damage which can affect a child in his adult years. According to Dailymail.co.uk, studies reveal that when you are older, you are four times more likely to endure back pains if you have already experienced back pains as a child. In order to prevent this from happening to your child, experts warned that parents should always keep an eye on their children’s backpacks. It is also highly advisable to let your child use medium-sized backpack with wide and padded straps to spread out the load evenly. As much as possible, never let your child wear a drawstring bag, or those with one strap worn over one shoulder because it can cause too much strain and may also lead to deformities. Wearing one-sided bags can cause harm as much as wearing a heavy backpack can. So the next time you take your child to school, it will always pay to weigh in the importance of letting him carry the right bag. It seems like a small thing to consider but years later, your child will thank you for it. Share this to spread the awareness across! Previous Post:Poor man gets rejected by a rich man’s daughter. Then they meet again after 10 years.